Bustling freight trains like this 41-carriage vehicle are a common site along the Chongqing to Duisburg rail route -- a modern "Silk Road" carrying goods from Asia to Europe and back again. The famous trade route once catered for wandering tradesmen carrying the likes of jade, spices and, of course, silk. Electronic components and computer parts are a more familiar cargo these days. The 11,179-kilometer network stretches across six countries (China, Kazakhstan, Russia, Belarus, Poland and Germany). 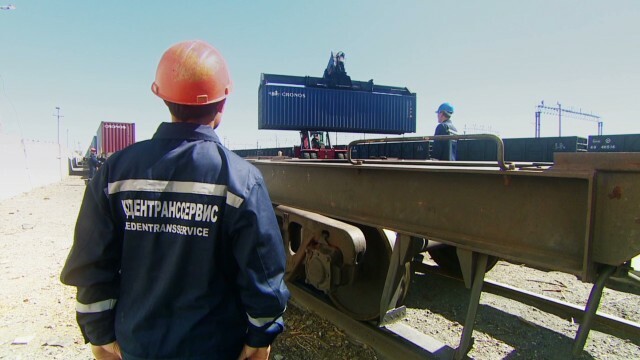 Chinese and European railways use different gauges than their Russian and former Soviet-nation counterparts, meaning cargo has to be transferred to suitable carriages at the borders of Kazakhstan and Germany. The Chongqing Duisburg rail-link is not the first to connect Asia and Europe. 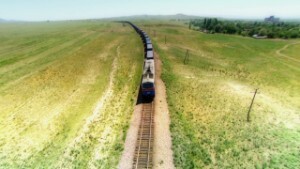 The Trans-Siberian Railway (pictured) has transported goods and people from Moscow to the Pacific-coast city of Vladivostok for just under a century. 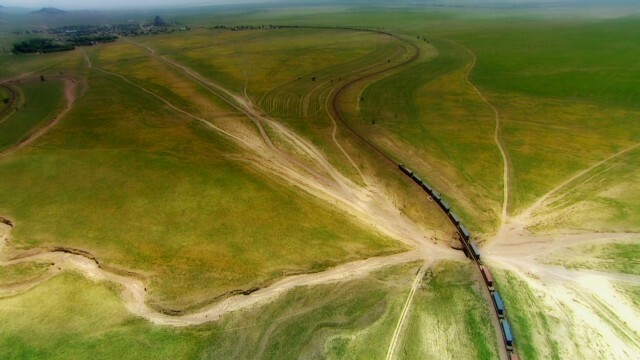 A train heads into the vast hinterland of rural Kazakhstan. An array of other routes for trans-continental rail travel have been identified by the likes of the United Nations Economic and Social Commission for Asia. The Gateway goes behind the scenes of the world's major transport hubs, revealing the logistics that keep goods and people moving. 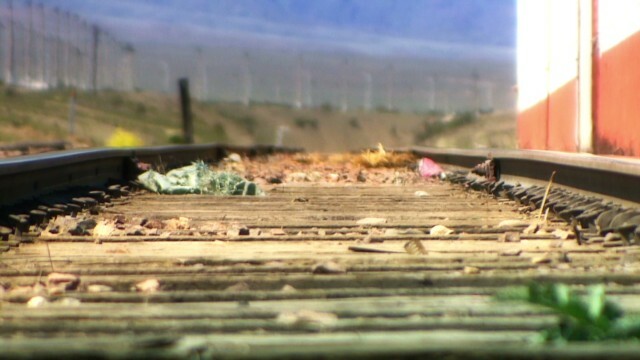 (CNN) -- In the smoggy cradle of China's industrial heartland, a heaving freight train gets set to depart along a modern incarnation of the legendary Silk Road trading route. This historic passageway was once worn into a dense chain of dusty trails by caravans of horses and camels carrying merchants and their many wares between continental Asia and Europe. Today it takes the form of a series of transnational rail tracks transporting the latest in electronic products and computer parts. Starting in the bustling mega city of Chongqing, southwest China, the 11,179-kilometer (6,946-mile) network stretches across six countries and vast unpopulated expanses all the way to Duisburg, Germany. "The railway (goes) through Xinjiang, Kazakhstan, Russia, Belarus, Poland and Germany and builds a new route for transportation," explained Dr Mu Huaping of the Chongqing Commission of Economy and Information Technology. 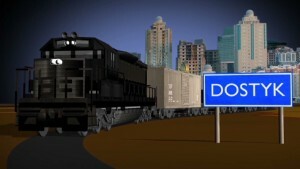 "If (the city) wants to go global, the railway serves an important role," Mu added. A freight-train departs Chongqing, China. For many companies with factories in fast-growing Chongqing, transferring items via rail to markets in Europe can be easier and quicker than sea freight from one of China's coastal ports. 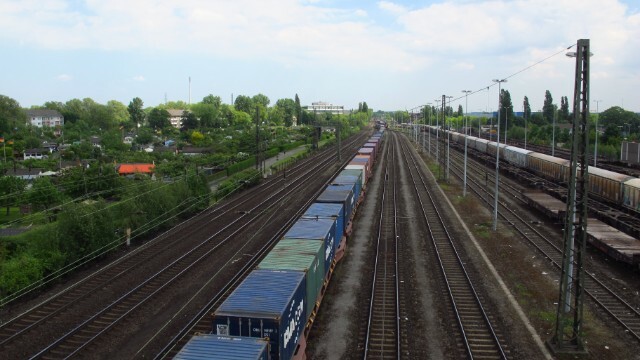 Mu points out that train journeys take just 16 days, comparing favorably to the more lengthy shipping routes where the costs and time of transporting cargo to the coast must also be added. 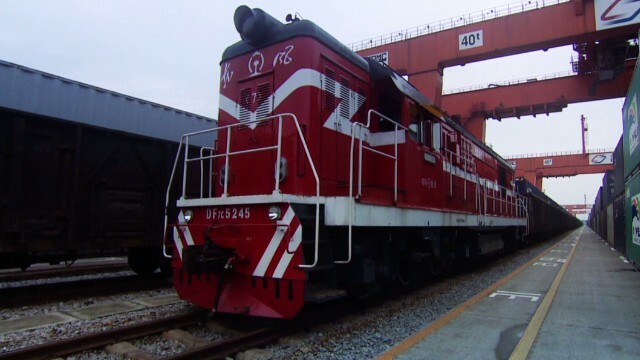 Since the rail network opened in 2011 (as a joint venture between track operator DB Schenker, the Chongqing Holding Group and the state railways of China, Kazakhstan and Russia) an increasing number of multinationals have taken advantage of the facility, Mu said. U.S. computer giant Hewlett Packard claims to have shipped more than 4 million notebook computers to Europe by train during this period. As more industry heads towards China's vast interior -- and cities like Chongqing expand, creating greater wealth and consumer spending power -- many observers believe rail freight will become an even more appealing cargo-transport option. "I think it's a very bright future for freight rail transport," said Michael Binyon, a British journalist who has written extensively on the subject of what he tentatively refers to as the "Iron Silk Road." "It's the only way to avoid the long sea routes. Airplanes are very expensive (and) road is out of the question (because) the volumes are too small." "Rail transportation," he added can be "a very efficient way, and a fairly fast way, of moving large volumes of freight from China to Europe." While this contemporary route (which plots a more northern course than its historic Silk Road counterpart) has been in operation for two years now, rail routes between Asia and Europe are far from a new development. 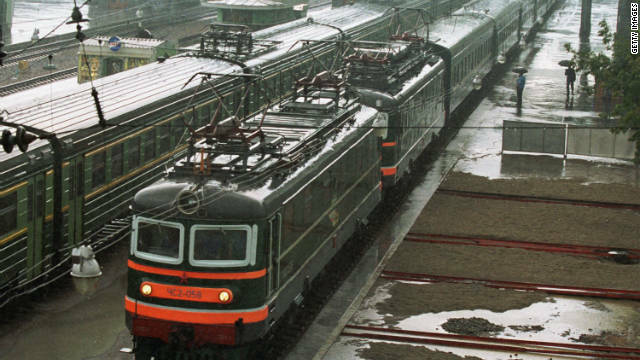 The Trans-Siberian Railway has been shifting goods and passengers between Moscow and Vladivostok on Russia's Pacific coast for just under a century, linking up with tracks in northern China and Mongolia along the way. In time, Binyon sees the potential for even more rail integration between the continents. He points to the Marmaray tunnel project (due to open later this year) that will marry tracks underneath the Bosphorous Strait, connecting Asiatic and European Turkey in the process. Organizations like the U.N. Economic and Social Commission for Asia (UNESCAP) meanwhile have long sought to facilitate a vast Trans-Asian Railway network that could link the continents. This intergovernmental project has the backing of 22 Asian nations and proposes lines that would connect Thailand, Myanmar, India, Pakistan, Iran and Turkey to southern Europe, as well as a Southeast Asian network that could theoretically extend all the way from Singapore to Europe via China. A north-south corridor stretching from Russia through Azerbaijan, Turkmenistan and Uzbekistan all the way to the Persian Gulf port of Bandar Abbas in Iran is also cited by the U.N. group as a possibility. When it comes to actually building these lines, however, the reality is infinitely more complex than simply plotting the routes and laying down tracks -- as the UNESCAP project has discovered since it was agreed in 2006. According to Christian Wolmar, a rail historian and author of the forthcoming book "To the Edge of the World," all manner of operational challenges must first be overcome. "Individual countries tend to use different styles, technologies, signaling systems and gauges," Wolmar explained. "That means creating a link across several nations is problematic ... and incredibly expensive." "Then there is also the politics. Can you go through northern Turkey or Iraq or Iran? "But that's not to say they (trains) don't have benefits. There is fantastic potential as they are a relatively green and sustainable mode of transport and can take vast loads with just a couple of people driving a train," he added. See also: Where is the world's best airport? Binyon also notes these difficulties but concurs with Wolmar's final point. He highlights how the Chongqing to Duisburg route has already overcome some of the standardization challenges by having cargo containers transferred to cars with new gauges at relevant border crossings to meet varying national track requirements. "If you can simplify it, if you can unify customs agreements and if you can have a standard operating system with rules agreed by all those along the route," he said, then railways are "an extremely efficient way of moving large numbers of people and freight from one population center to the other." What will the airport of the tomorrow look like? We've compiled some of the most exciting projects in an interactive feature. Could port herald new age for Cuba? In the sleepy seaside town of Mariel, northwest Cuba, a hulking monument to the communist islands' evolving economy is taking shape. Meet Russian Tugboat captain, Viktor Nikolsky, who has sailed the world's seas and survived being hijacked by Somali pirates. Meet Sergey Matveev and family, St Petersburg's "First Family" of drawbridge operators. Where are the world's most dangerous waters? Hint; they're not off the coast of Somalia. Train and metro stations have become unlikely havens for some of the most exquisite architecture and design. We profile some of the best. What have 29,000 plastic toys that fell overboard a cargo ship in 1992 been doing for the last 21 years? How are ports adapting to cope with the new generation of giant cargo ships? Where is the world's busiest airport? London, Beijing or somewhere in the United States: Where is the world's busiest airport? Find out in our detailed infographic. Are gondolas urban transport solution? Urban gondolas are offering cheap and effective methods of mass-transportation in some of South America's biggest cities. The Silk Road was once a series of dusty trails forged by traders traveling between Asia and Europe. Today it takes the form of a bustling railway. An all new class of container ship, the Triple E is a quarter-of-a-mile long and built from enough steel to construct 8 Eiffel Towers. Take a peek at some of the most exciting travel infrastructure projects currently in the works around the world.